Today is Google’s 12th birthday and as everyone expected Google replaced its logo with a new doodle – Birthday Cake Painting. 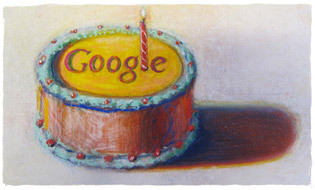 This birthday doodle is not painted by Google’s Dannies Hwang, but by a popular American painter Wayne Thiebaud, who is known for pop art movement. It was never clear when the birthday of Google is. The company was founded on September 4th and the domain name google.com was registered on September 15th. Yet Google prefers to celebrate their birthday on September 27th. No issues, it’s their birthday and they can celebrate whenever they want. During the 12 years of Google’s glorious journey it revolutionized internet and the way every individual uses internet. Thanks you Google for the wonderful web you gave us. Wish you many more happy returns of the day.